The 2.7 mile trail to Moxham Mountain was constructed in the summer of 2012 and features many overlooks with scenic views, while the most spectacular views are from the 2418 foot summit. 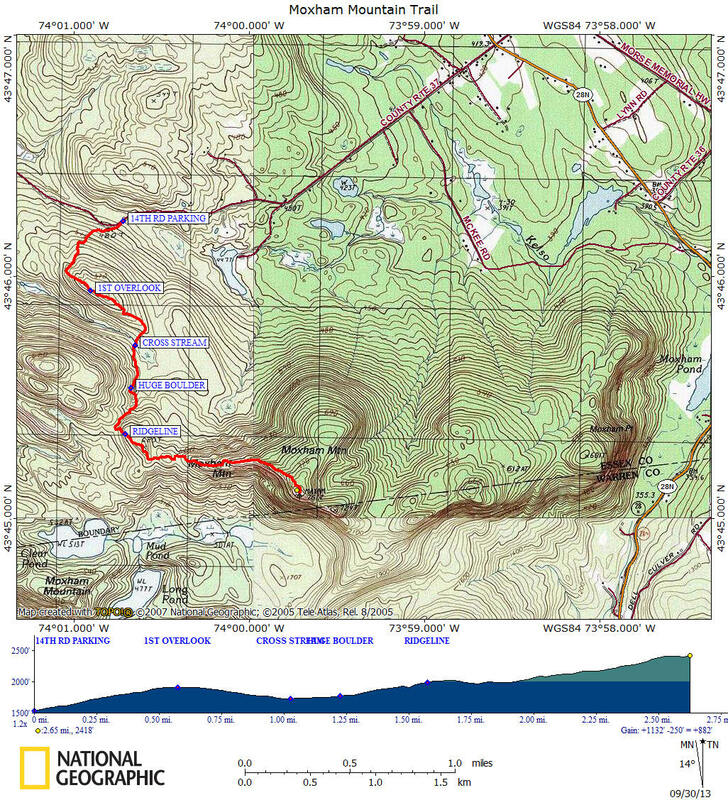 There is an elevation gain of 1152 feet for this 2.7 mile hike to the summit, however the trail was built to minimize the climb as much as possible. This is a truly enjoyable hike with view, after view, after another view in the Vanderwhacker Mountain Wild Forest of the Adirondacks. This hike begins at the small parking area along 14th Road off NY 28N in Minerva about 0.2 miles after the pavement ends. The only marking at the parking area is a "Trail Parking" sign, however it is pretty obvious as you drive down the dirt road on the left. The trail starts on the right side of the small parking area (elevation 1536 feet). You're following yellow DEC trail markers. The trail immediately climbs and reaches the first of many overlooks at 0.6 miles (elevation 1904 feet). This view is just a teaser for what's ahead, but is still a good place to take a break. The trail now descends and at 1.0 miles crosses a small stream (elevation 1724 feet). It's the outlet of an old beaver pond located just a short distance upstream. Now climbing again, pass a huge boulder on your left at 1.25 miles. Soon is another view, better than the first view with Gore Mountain as the main feature. At 1.6 miles reach the ridgeline (elevation 1993 feet) and soon you start to reach one after another of the many overlooks that line this wonderful trail. At 2.3 miles reach possibly the best of the pre summit views as the cliffs of Moxham Mountain summit come into view (elevation 2172 feet). Up there is your final destination and it's only 0.4 miles away. There are still more overlooks as you continue your climb toward the summit, reaching the 2418 foot summit at 2.7 miles. While not a 360 degree view, the views are still spectacular and the open rocks offer a great picnic spot. As you approach the edge of the summit, remember you are on top of cliffs (so take special care). The NY DEC announced in the spring of 2014 that this trail will become part of the future North Country Trail that will travel through the area. Directions: Take NY 28N WEST out of North Creek toward Minerva. That major rock mountain on your left as your driving along NY 28N is Moxham Mountain. In Minerva, turn left on 14th Road. Follow 14th Road to the end of the pavement and another 0.2 miles along the dirt road to the small parking area on the left. The GPS coordinates are N43 46.227 W74 00.720 for those who have a GPS devise in their vehicle. Look below for a few pictures, a map and a video of this spectacular hike.